The survey demonstrates little change between time points; 4 years earlier (in 2005–2006), 41% of youth with SHCN met the transition core outcome.11 These national data reveal that most youth with SHCN have discussed with their health care providers taking increased responsibility for self-care, but far fewer have discussed transition to an adult health care provider. Those least likely to have received needed transition support are those in low-income families, from racial/ethnic minority groups, and those without a medical home. Since 2002, a number of studies have examined the barriers to transition from the perspectives of health care providers. In a national study of pediatricians,20 major gaps were revealed in the implementation of recommended transition activities. For instance, few pediatric practices initiate planning for transition early in adolescence; and most do not organize their office systems or care processes to make available educational materials, a transition plan, portable medical summary, or referrals to adult physicians. Pediatricians report numerous barriers that affect the transition support services they are able to provide, including shortages of available adult providers, lack of reimbursement and time for transition services, lack of an identified person responsible for transition planning, and little information about community support services. Also important are difficulties in breaking the bond that pediatricians have with their patients and parents. From the perspective of internists, similar and different areas of concern about receiving youth with SHCN have been identified.21, 22 These include lack of training on childhood chronic illness; lack of information from and communication with the pediatric provider about the youth being transferred; reimbursement concerns; lack of insurance continuity among young adults; lack of staff training; and challenges in caring for some young adults with SHCN when families do not remain involved and guardianship issues have not been addressed. Both pediatric and adult health care provider respondents sought explicit practice approaches and tools to help them make the transition successful. Until now, relatively few attempts have been made to implement comprehensive transition quality improvements in pediatric and adult primary care settings consistent with recommended medical practice. The clinical report includes an algorithm that provides a logical framework for transition support during adolescence and young adulthood. The algorithm starts with introducing the transition policy at the 12- to 13-year-old visit, which accumulating data suggest is an important developmental time to introduce the transition process,24,25 and it concludes when the youth is receiving health care in an adult model of care and/or in an adult-focused health care delivery system. A core concept of the transition process is having the youth understand and experience an adult model of care at the age of majority or 18 years of age, even if they have not transferred to an adult practice. The experience of an adult model of care in the pediatric setting gives youth the opportunity to practice their skills on how to manage their own health care under the watchful guidance of their pediatric provider. These self-care skills are required to navigate the adult health care system and are learned in the transition preparation process in the pediatric health care system. The adult model of care acknowledges that youth, 18 years of age and older, have primary responsibility for their own health care. This represents a major shift from a pediatric model of care, in which the parent/caregiver is in charge. Youth may authorize other individuals to be involved in their health care after the age of 18 based on HIPPA privacy rules. This means that youth without cognitive challenges should be seen alone without their parents unless they have authorized them in writing to be present. For those with cognitive challenges who may need a level of guardianship, clarifying their ability to manage their own health care should be discussed and the appropriate legal processes completed before the youth turns 18 years of age. This legal information should be included in the youth’s medical record at age 18 and then sent to the adult health care provider before the initial visit if the young adult is 18 years of age or older. 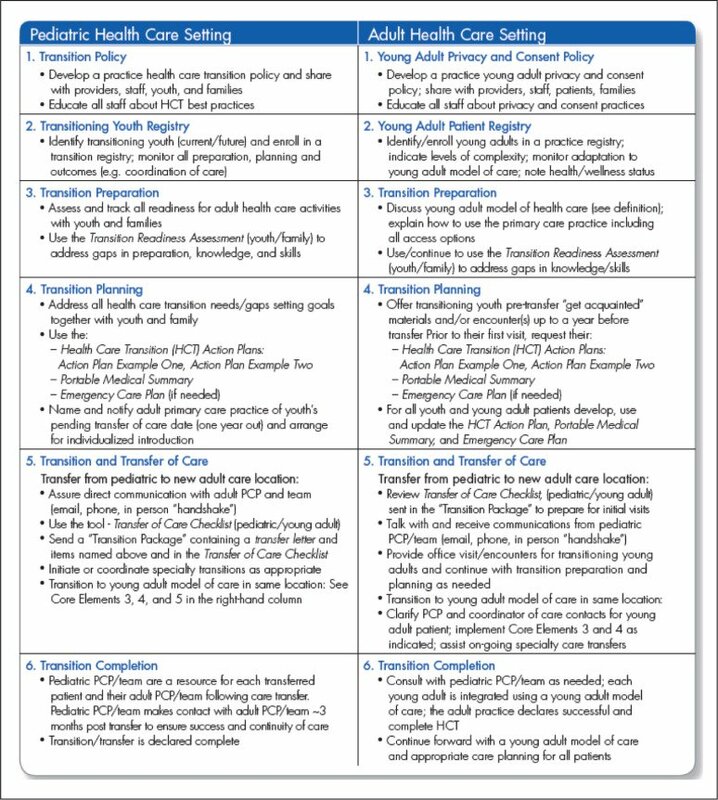 To translate the algorithm into a set of tools for pediatric and adult practices, GotTransition, the federally funded National Health Care Transition Center (NHCTC), developed a change package called the Six Core Elements of Health Care Transition.26 The six core elements include actions for both adult and pediatric providers, as shown in Table 1 (see page e4). 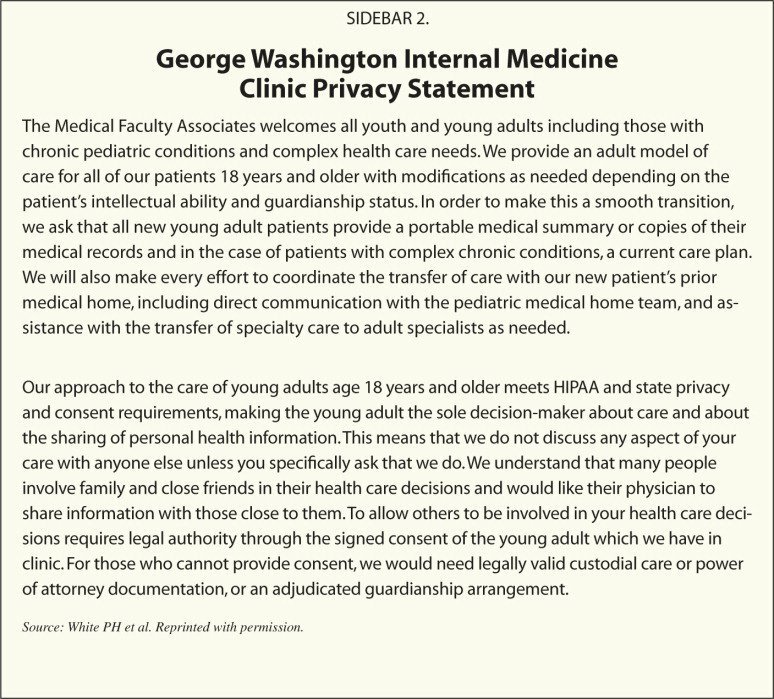 For example, in the pediatric practice, a transition policy, or approach that includes an age when the youth will experience an adult model of care, should be developed for all providers and staff to use, and in the adult practice, a young adult privacy and consent policy should be developed. Table 1. The Six Core Elements of Health Care Transition. GotTransition, the National Health Care Transition Center of the Center for Medical Home Improvement at Crotched Mountain Foundation — funded through a cooperative agreement (U39MC18176) US Maternal and Child Health Bureau, HRSA, DHHS. Other core elements include a transitioning youth or young adult registry of the patients the practice identifies as having a high need for transition services; transition preparation to assess and track self-care management competencies; transition planning that includes the development of a transition actionable care plan, a portable medical summary, and, if needed, an emergency care plan; transition and transfer of care that incorporates all of the up-to-date medical documents, communication to the adult health care provider; and transition completion that confirms that the youth/young adult with SHCN has successfully completed the transfer to an adult health care provider. To bring the health care transition (HCT) clinical report and the Six Core Elements to life, The National Alliance to Advance Adolescent Health, in partnership with the NHCTC, initiated the District of Columbia Learning Collective (DC-LC) in 2010. The District of Columbia was the first among a growing number of GotTransition learning collaborative sites including, Boston, Denver, and five sites in New Hampshire to test and implement the Six Core Elements of HCT. Distinct about DC-LC has been the focus on primary care practice as the first step in the quality improvement (QI) process, the level of investment that the District of Columbia Department of Health has made to The National Alliance and the participating teams for intensive training sessions, faculty and content support from the NHCTC, and ongoing coaching support to the practices from the authors. The quality improvement methodology used in the DC-LC is based on the “Breakthrough Series Learning Collaborative,” widely used in implementing the chronic care model and medical home programs with well-documented results.29 The Breakthrough Series is a learning approach for health care teams interested in making improvements in specific areas. It emphasizes interactive training and requires focused work by each team to adapt best practices to their settings during a 12- to 24-month learning period. Participants share and learn from collective experiences and challenges. Typically, there are three in-person 1- to 3-day LC learning sessions between which action periods are supported with monthly conference calls and consultation. In the DC-LC, the five lead primary care practice teams include one pediatric clinic, two adolescent clinics, one family medicine clinic, and one internal medicine clinic all part of academic health centers with training programs. Each team includes a lead physician, a care coordinator who is a social worker, nurse, or trained parent “navigator,” and a consumer who is either a young adult with SHCN or a parent whose teen has SHCN. In two of the practices, residents participate, as well. Leadership support has been provided to each team by pediatric, family medicine, and internal medicine department chairs. The transitional learning objectives for the DC-LC were developed collaboratively by the NHCTC and are based on the Six Core Elements of HCT described earlier.30 A charter was developed for the HCT learning collaborative with clear delineation of project goals, measures, and participant and faculty expectations. The goals for the learning collaborative specified that each participating practice will: 1) develop/share a written transition policy; 2) use a registry for tracking patients’ transition progress; 3) test and improve the use of transition tools (readiness assessments, portable medical summaries, transition action plan); and 4) define and implement the transition/transfer of care to an adult model of care starting at age 18 (unless contraindicated by cognitive disability or guardianship status). The measures used are derived from the newly developed pediatric and adult medical home HCT index, also consistent with the Six Core Elements. At the learning collaborative level, the charter calls for all of the participating practices to demonstrate at least a 30% improvement in the HCT index, and all will have a written transition policy accessible to patients and families and familiar to all staff. At the individual practice level, the charter calls for 1) at least two youth or young adults to be entered into a health care transition registry during each month of the collaborative; 2) at least two transition tools to be used in the care of 90% of the youth or young adults in the registry; 3) implementation of a defined adult model of care documented for all youth in the registry that reach 18 years (except when contraindicated); 4) explicit communication and timely transfer of summary information for all youth and young adults in the registry who require transfer of care; and 5) periodic short prospective surveys of youth and families, increased levels of readiness for and satisfaction with, the health care transition process. Faculty expectations were also specified, including three face-to-face learning sessions, monthly conference calls and on-site assistance, communication via listserv, and provision of relevant tools and resources. Each of the lead physicians signed this charter on behalf of their institution. Before the start of the learning collaborative, all of the selected teams participated in a pre-work phase, which involved onsite meetings with the lead physicians to provide background on health care transition — specifically, the recommendations from the transition clinical report, the preliminary plans for the learning collaborative, expectations for participating teams, and organizational and team readiness. The pre-work phase also included a dinner with the lead physicians from all five sites, providing time to get acquainted and to review the transition charter. The learning sessions occurred every 4 months during an 18-month period. During the learning sessions, faculty reviewed the clinical report and recommended core elements; each of the teams worked together and learned about each other’s strategies and challenges in piloting the six core elements into their practice processes so the lead physician was not the only team member moving the transition process forward. The DC-LC also identified areas where teams wanted more information (eg, guardianship, health information technology (HIT), consumer involvement, and payment options). These topics were covered during the learning sessions or on the monthly conference call between the learning sessions. In between the learning sessions was an action period in which change ideas were tested in Plan-Do-Study-Act Cycles. Each team was encouraged to set aside time to implement and test small incremental changes until they felt that they had identified the most effective transition approach.30 As noted earlier, the teams were given sample transition tools and were asked to customize the tools for their individual practice sites and vet them with other health care providers, youth, families, and administrative and legal staff. See Sidebars 1 and 2 (see page e5) for transition policy/privacy and consent examples from two of the DC-LC sites. To assess whether improvements in health care transitions were taking place during the course of the 18-month learning collaborative, each of the teams completed the HCT index at the outset of the project, after 1 year, and at the end. Marked improvements were accomplished in all of the Six Core Elements; the results of this collaborative will be published soon. There are several early lessons learned from implementing transition quality improvements in the DC-LC. Having the involvement and leadership from all of the pediatric/adolescent, family medicine, and internal medicine academic programs in the District of Columbia was incredibly important, and working with lead physicians committed to this QI project was essential. In addition, having pediatric and adult practices participate together built trust and understanding of the distinct issues that the respective pediatric and adult practices face when supporting patient self-care management and implementing a successful transfer. It was also very helpful having ready-made tools aligned with the new clinical report, which practices could easily customize and utilize. Starting with a defined population — in the DC-LC case, the Medicaid-insured youth with SHCN enrolled in a Medicaid managed care plan for children with special needs (HSCSN) — provided an important common population. Although each practice has expanded its transition population to a broader group, at the outset, it was helpful to start with a clearly defined population and also to collaborate with HSCSN around population identification and care coordination. Last but not least, a key lesson learned is that finding adult physicians willing to be an active participant in the process is made much easier when they can expect new patients will come with an up-to-date medical summary, exposure to an adult model of care with some level of self-care management skills, a one-page information sheet on the pediatric illness of the youth being transferred, guardianship and/or alternatives for decision-making support having been clarified before age 18 years, and when a referring pediatric provider communicates to the adult health care provider and makes himself/herself available for consultative support, as needed. Incorporating the Six Core Elements of Health Care Transition into ongoing clinical processes has taken longer and is more challenging than anticipated, in part because these participating clinics are part of large academic institutions that have extensive requirements to allow clinic process changes such as posting a transition policy in the clinic area. Another time-related factor has been the relatively recent introduction of electronic health record systems within these sites. Implementing QI was also more challenging because so many older adolescents and young adults were “backed up” in the pediatric system and had little or no transition preparation. Starting with a mix of youth at various ages (12–14 years, 15–18 years, 19+ years of age) provides greater balance and demonstrates the value of early planning and preparation. Another challenge was having sufficient care coordination support to proactively reach out and deliver recommended transition services. Although a small portion of a care manager’s time at each site has been funded under this project, it is not sufficient; therefore, too much responsibility for transition QI falls to the physician. Unfortunately, at the time of this DC-LC, no public or private insurers in the District of Columbia provided financial incentives for medical home nor support care coordination functions in primary care settings. Incorporating transition into practices recognized as medical homes would clearly make the QI effort much simpler. Having transition supported through the reimbursement system is an essential ingredient to sustaining a successful transition component to the medical home. Thus, working to make those financial changes is a crucial part of creating a sustainable transition process for youth with SHCN. Youth who have grown up with chronic illnesses and disabilities now largely survive into adulthood seek to be an integral part of their community and to live healthy, productive adult lives. The QI methodology reviewed here can be utilized by all pediatric, family medicine, and adult medical practices to optimize the transition for youth/emerging adults and their families/caregivers as they move from pediatric health care to adult health care systems. The careful planning, shared responsibility, and explicit roles of all involved maximize the quality of care through this transition process and the transfer from pediatric to adult health care professionals. Kieckhefer GM, Trahms CM. Supporting development of children with chronic conditions: from compliance toward shared management. Pediatr Nurs. 2000;26(4):354–363. Gorter JW, Stewart D, Woodbury-Smith M, et al. Developmental Trajectories of Youth with Disabilities (12–25 years of age): A Knowledge Synthesis. Final Paper to Ministry of Children and Youth Services. Hamilton, Ontario: Mcmaster University, Feb.28, 2011. A consensus statement on health care transitions for young adults with special health care needs. American Academy of Pediatrics; American Academy of Family Physicians; American College of Physicians-American Society of Internal Medicine. Pediatrics. 2002;110(6 Pt 2):1304–1306. Special analysis of the 2009/10 National Survey of Children with Special Health Care Needs by Lauren Pollack and Margaret McManus of The National Alliance to Advance Adolescent Health, March2012. Special analysis of the 2005/06 National Survey of Children with Special Health Care Needs by Lauren Pollack and Margaret McManus of The National Alliance to Advance Adolescent Health, March2012. Transition to adult care for youth with special health care needs. Paediatr Child Health. 2007;12(9):785–793. Royal Australasian College of Physicians Policy Statement 2007: Transition to Adult Health Services for Adolescents with Chronic Conditions. www.racp.edu.au. Accessed April 9, 2012. Fredericks EM, Dore-Stites D, Well A, Magee JC, Freed GL, Shieck V, James Lopez M. Assessment of transition readiness skills and adherence in pediatric liver transplant recipients. Pediatr Transplant. 2010;14(8):944–953. doi:10.1111/j.1399-3046.2010.01349.x [CrossRef] . Schwartz LA, Tuchman LK, Hobbie WL, Ginsberg JP. A social-ecological model of readiness for transition to adult-orientd care for adolescents and young adults with chronic health conditions. Child Care Health Dev. 2011;37(6):883–95. doi:10.1111/j.1365-2214.2011.01282.x [CrossRef] . McManus M, Fox H, O’Connor K, Chapman T, MacKinnon J. Pediatric Perspectives and Practices on Transitioning Adolescents with Special Health Care Needs to Adult Health Care. Washington DC: National Alliance to Advance Adolescent Health; 2008. Fact Sheet No. 6 Available at www.thenationalliance.org. Accessed March 2, 2012. National Health Care Transition Center. Six Core Elements of Health Care Transition. Available at: www.gottransition.org. Accessed April 9, 2012. National Health Care Transition Center. Medical Home Transition Index for Youth Up to Age 18 Years and Over 18 Years. Available at: www.gottransition.org. Accessed April 9, 2012. Kilo CM. A framework for collaborative improvement: lessons from the Institute for Healthcare Improvement’s Breakthrough Series. Qual Manag Health Care. 1998;6(4):1–13. National Health Care Transition Center. DC-LC Transition Tools and Measurement Indices Used by the DC-LC. Available at: www.gottransition.org. Accessed April 9, 2012. Patience H. White, MD, MA, is Professor of Medicine and Pediatrics, George Washington University School of Medicine and Health Sciences; and Vice President, Public Health, Arthritis Foundation, Washington DC. Margaret A. McManus, MHS, is President, The National Alliance to Advance Adolescent Health, Washington, DC. Jeanne W. McAllister, BSN, MS, MHA, is Director, Center for Medical Home Improvement; and Adjunct Assistant Professor of Psychiatry & Pediatrics Geisel School of Medicine at Dartmouth Crotched Mountain Foundation. W. Carl Cooley, MD, is Medical Director, Center for Medical Home Improvement, Concord, NH; and Chief Medical Officer, Crotched Mountain Foundation; and Adjunct Professor of Pediatrics, Geisel School of Medicine at Dartmouth. Dr. White and Ms. McManus are co-principal investigators of Destination Known: Making Health Care Transition Happen for Youth with Special Health Care Needs in the District of Columbia, a grant funded by the District of Columbia Department of Health. The authors appreciate the commitment to quality improvement from each of the transition teams at Children’s National Medical Center’s Adolescent Clinic; Children’s Health Center at Adams Morgan; Georgetown Adolescent Clinic; Howard’s Family Medicine Clinic; and George Washington’s Internal Medicine Clinic. GotTransition — the National Health Care Transition Center is funded by the cooperative agreement #U39MC18176 between the Crotched Mountain Foundation and HRSA/USMCHB.